The one tool for common faucet installations and sink strainers. Unique cubed insert provides a variety of common nut sizes. Ideal for most common 2, 3, 4, and 6 tab mounting nuts. 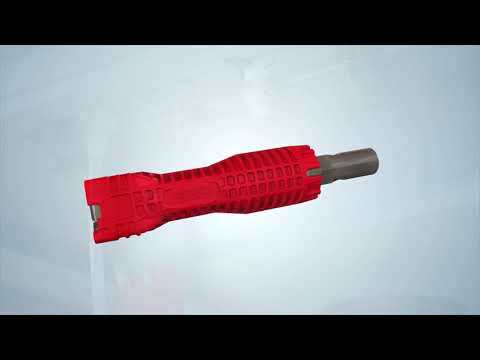 Wrench for tight shut-off valves. Retainer for 3 or 4 slot strainer baskets. 5/8" deep welled socket for many single hole mountings • Short body for clearance in tight spaces. Reinforced Body For Hard to Break Fasteners. ⅝”, ¾”, ⅞”, & 1” Wrenches For Supply Lines and Clamp Nuts. ⅝” Deep Welled Sock For Common Faucet Design. 3 & 4 Slot Strainer Basket Retainer. 2, 3, 4 & 6 Tab Faucet Nut Wrench. Will this tool work on all faucets? - For the most part yes, most faucets that use mounting nuts use common nut sizes. There are slots to accommodate various tab nuts. Is this tool made to remove frozen nuts? - The tool is made to common nut torque requirements. EZ Change Faucet Tool is rated 4.9 out of 5 by 8. Rated 5 out of 5 by MrBert from Nifty Plumbing Tool A plumber turned me on to this tool so I went out and bought one at Home Depot. I am ready for the next plumbing job. Rated 4 out of 5 by Optimus from Excellent tool I used it to change four faucets in the bathroom and kitchen and it works like a charm. However, when I used it to replace my tub drain to my dismay the attachment I’m using snapped. I can’t believe it broke, emailed customer service informed them what happened I was told they will get back at me. I’m confident that they will send me a replacement but overall it’s an awesome tool. Rated 5 out of 5 by JJSJ from Very easy to use on ALOT of things! I use this tool on a daily basis . This has SO MANY uses its hard to believe it took me this long to buy it. Its better then the one I had before .Worth EVERY penny. Rated 5 out of 5 by dkm5 from versatile had your other tool in the past. this one i only take the one tool instead of many other tools. Rated 5 out of 5 by Mike1980 from this product has great features While I have not used all of the features of this tool yet, the ones I have used are great! this is a very convenient tool to have in my tool box. If you have ever had to crawl under a bathroom vanity or a kitchen sink and try to reach up an tighten or loosen a connection with a standard wrench, once you use this tool you will wonder why you havent had one before! Rated 5 out of 5 by Reid from The catch all tool I bought this to change out my faucet. It is truly the catch all tool. One problem though, it hasn’t been in my tool box much ever since I got it. Everyone has borrowed it since. What is the difference between the EZ Change Faucet Tool and the Model #2006 Faucet &amp; Sink Installer? The EZ Change Faucet Tool and the #2006 Faucet &amp; Sink Installer both appear to do very similar things. What are the differences between two? What can this tool do that the #2006 Faucet &amp; Sink Installer cannot and visa versa? Thanks for writing to us! The &quot;EZ Change Faucet Tool&quot; is our latest model. It is similar to the previous model, but is much smaller to allow access to tighter areas. It's also been updated to work on numerous additional applications. Where is the Serial Number located? I do not see a number stamped on the unit but there is a number next to the Bar Code on the package.